So Proud of Them! 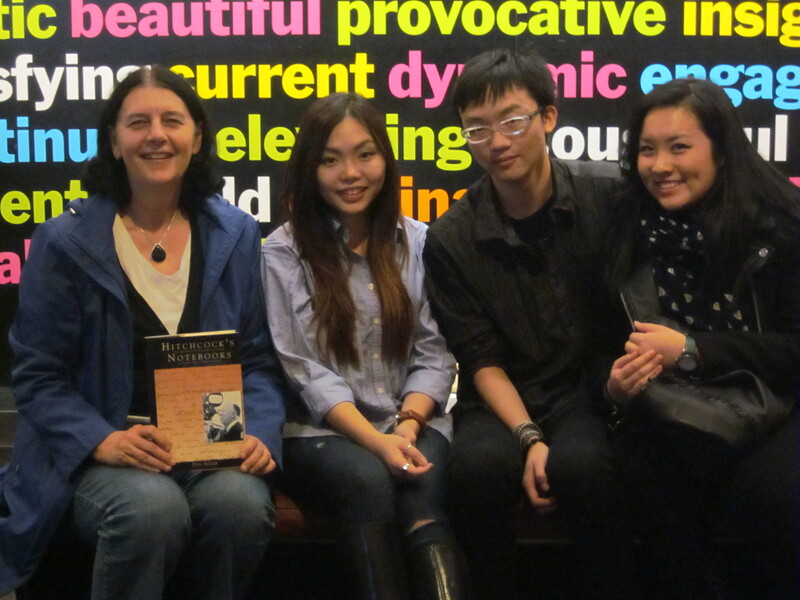 Visiting my Students in New York! | What Next? ← The Tigers Met The Yankees And We Were There! So Proud of Them! Visiting my Students in New York! The highlight of my time in New York so far would definitely have to be the day I spent with three of my former students. 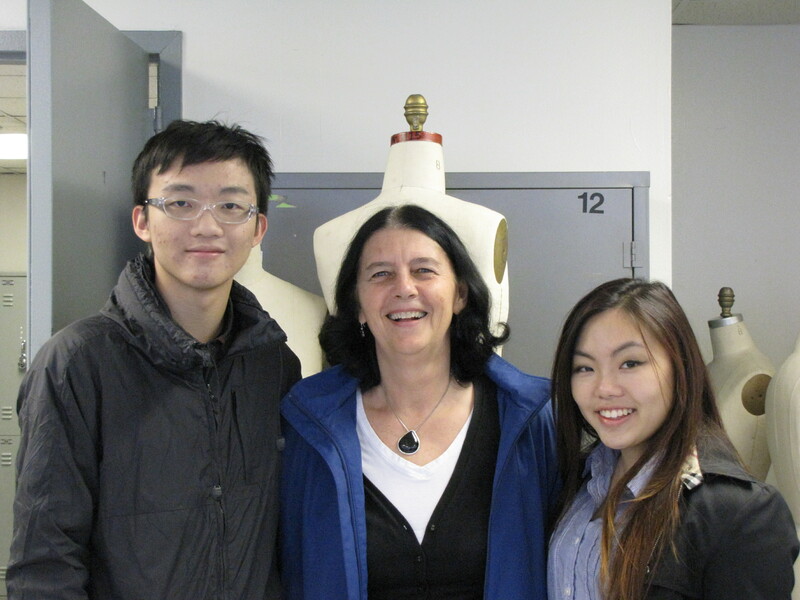 I taught Gaby, Stephanie and Michael at the International Christian School in Hong Kong. All three are now students at Parsons The New School For Design in New York City. I had Gaby and Michael in my class when they were in fifth grade and also had them in a number of my writing and literature courses several years later when I moved to the high school English Department. Stephanie was in three of my high school classes. Although Michael is an architecture student at a different Parsons Campus he came along as Gaby showed us the fashion design school in Times Square. Parsons is well-known for being the site where the popular television show Project Runway is filmed. Gaby talked about the courses she is taking and some of the projects she has done as she took us through the studios filled with sewing machines, mannequins and work- tables. 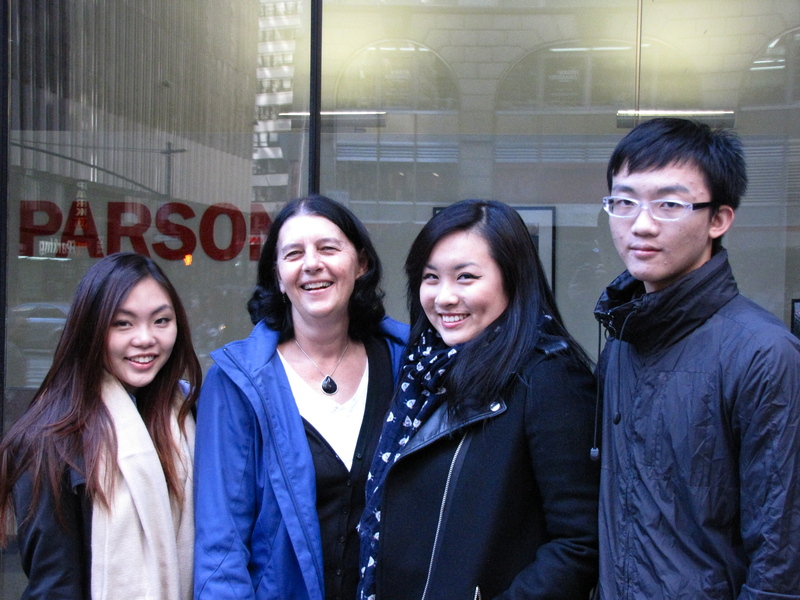 Parsons has an excellent reputation and many of New York’s finest fashion design firms come to the school looking for interns and employees. My husband Dave was along for the Parsons tour too and he asked Gaby and Michael questions about things they had done in New York. Both had enjoyed a Shakespeare theatre called Sleep No More. Gaby had been to see the musical Wicked and on her recommendation Dave purchased us tickets. It sounded like the Parsons work load is very heavy and there isn’t a lot of free time for entertainment. 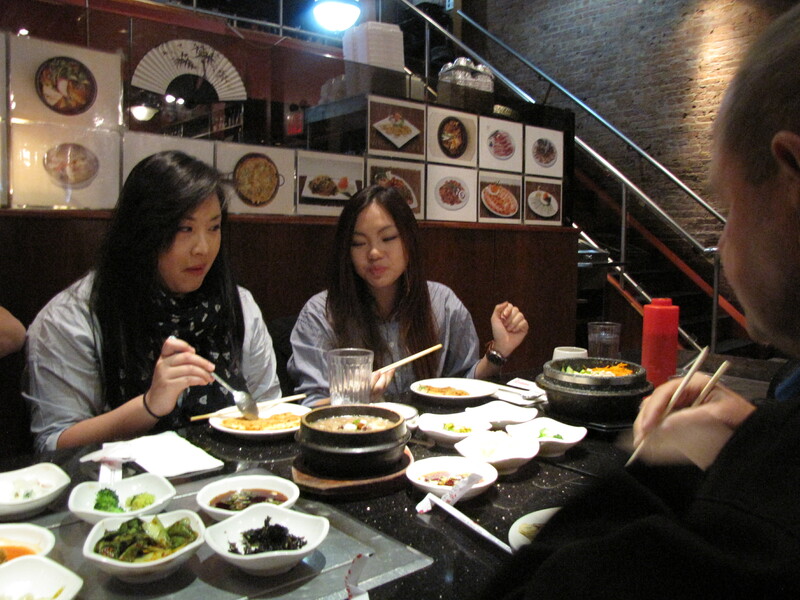 Gaby, Michael and Stephanie treated us to lunch at a Korean restaurant. We continued visiting, learning more about their studies and catching up on news about their families. I know both Michael and Gaby’s younger siblings and couldn’t believe they were already in tenth grade. Gaby and Michael live in the Parsons dorm while Stephanie shares an apartment with a cousin. 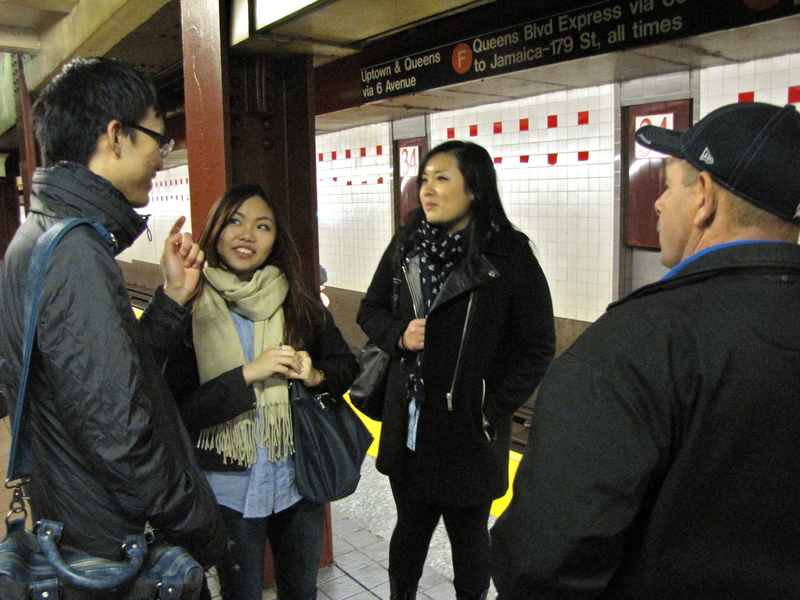 We found out that 50% of the students at Parsons are international students, many of them from Korea. The three former ICS students are often complimented on their excellent command of the English language compared to some of their other international classmates. Our visiting continued in the train station. I found out that most of the Parsons instructors are working designers, artists and architects. They have their own businesses and clients and also teach at Parsons. Because they are practicing professionals they are up to date and creative in their teaching. Michael told me Parsons emphasizes the design aspect of architecture and he described a recent project he had done designing a pool house. Gaby described a project designing new tailor-made clothing for the women featured on the Shanghai Ladies posters of the early 1900’s. 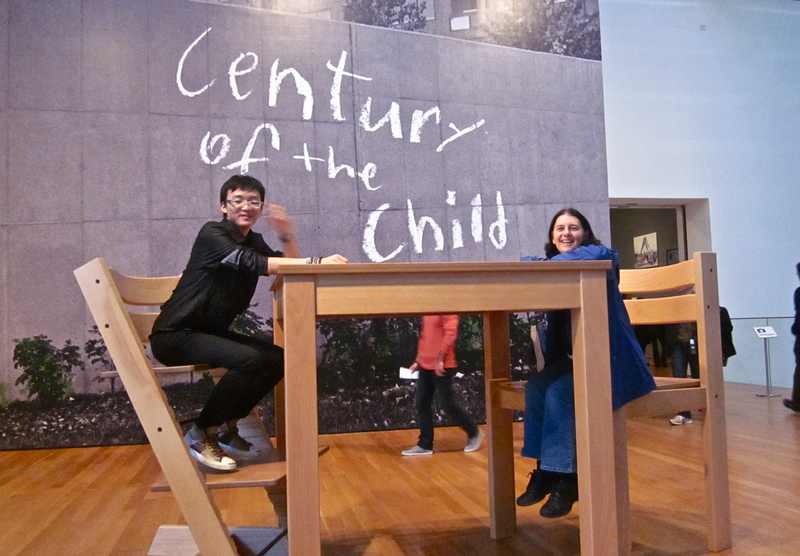 Here Michael and I pose in the MOMA at the entrance to an exhibit about the design of children’s toys. 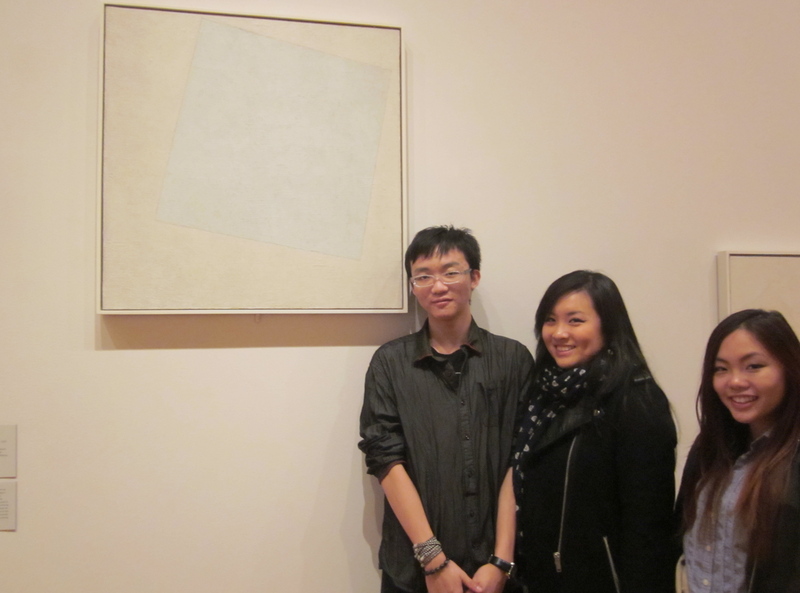 It was such a pleasure to tour the MOMA with my students. All three had been there many times to do research for papers and complete assignments for their classes. They knew so much about the art and the artists whose work is featured at the MOMA. They told me about the personal lives of many of the artists and how that had influenced their work. They showed me art pieces that had inspired their own designs and artwork. They gave me insight into the history of various art movements. All three mentioned how much they appreciated the training and skills they had received from their art teacher Mr. Chris Meyer at ICS. He had definitely laid a solid foundation for their studies at Parsons. 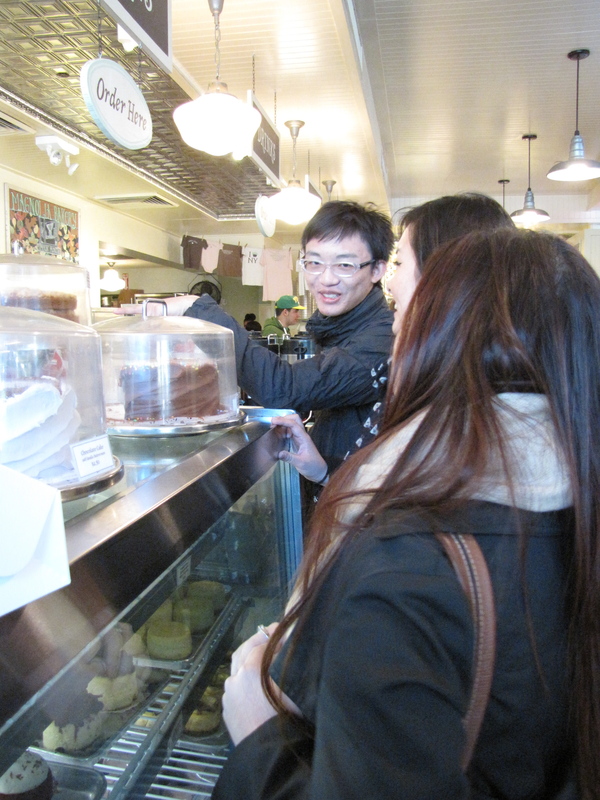 Eventually we headed to the MOMA cafe area to enjoy our treats from the Magnolia Bakery. Before we said good-bye my students presented me with a gift. Gaby and Stephanie had been in my English class where we did a film unit and studied the work of Alfred Hitchcock together. Gaby and Michael had gone to a book store called The Strand which sells rare and out of print books and found a book that featured the personal notes and sketches that Hitchcock made as he planned his movies. Such a thoughtful gift and something I wasn’t expecting at all. We parted with big hugs all around. I hadn’t seen Gaby, Michael and Stephanie for over a year. It was so great to witness the way they have become mature and accomplished young adults, at home in their New York surroundings, and pursuing their artistic passions with such joy and confidence.